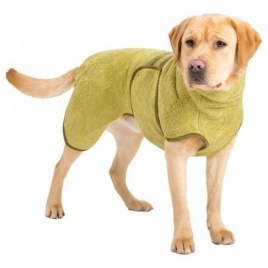 We have been trialling these drying coats on our own dogs here at Camddwr, and have to say that they are really very impressive! They take the bulk of the moisture from the dog in as little as 10 minutes, eliminate that lovely wet dog smell- and the dogs are cosy and happy to wear these while drying. We have some of the wettest weather in the UK here in North Wales, and no shortage of mud either so they really have had a thorough testing! a real thumbs up from Batman and Tog who have been roadtesting these coats!